Inspired by the movie Barbie and Her Sisters in a Puppy Chase, these two are ready for an island dance party. The horse plays three different songs, and Barbie doll and her horse have three different ways to get the party started: They can dance together with Barbie seated on top in the horse's pink saddle; they can dance together with Barbie standing next to her horse; or the horse can dance alone! Activate the dancing with the push of a button on the horse's mane. Requires 4x "AAA" batteries, Not included. Ages 3 and up. Barbie doll is ready for a dance-off in a colorful top with sheer overlay, blue plastic pants, short brown boots, and a pink helmet, all inspired by the tropical setting of the movie. Her pretty horse matches with a pink flower-adorned bridle, reins, neck collar, non-removable saddle, and soft mane and tail. 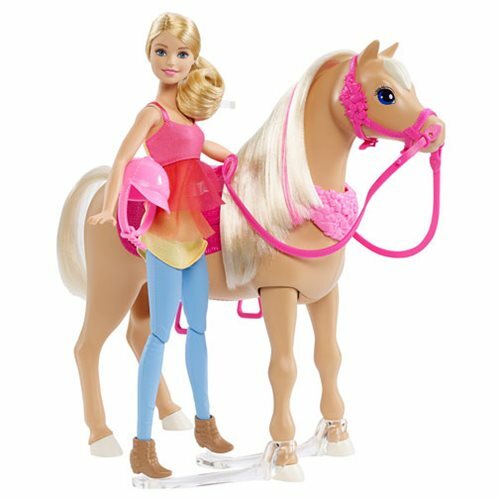 Order your Barbie Dancin' Fun Horse and Doll, and collect all the dolls and accessories based on the movie for even more action and family fun! Other dolls sold separately.